Mayo 0-10 Leitrim 0-6 (Ballyhaunis, 8/1/2012). MAYO: David Clarke; Shane McHale, Eoghan Reilly, Lee Keegan; Peadar Gardiner, Donal Vaughan, Colm Boyle (0-1); Barry Moran, Seamus O’Shea; Kevin McLoughlin, Pat Harte, Danny Kirby (0-1); Enda Varley (0-4, three frees), Darren Coen (0-2), Michael Conroy. Subs: Conor Mortimer (0-2, one free) for Harte, Ger Cafferkey for McHale, Richie Feeney for McLoughlin. Mayo 4-11 GMIT 0-11 (Ballinrobe, 15/1/2012). 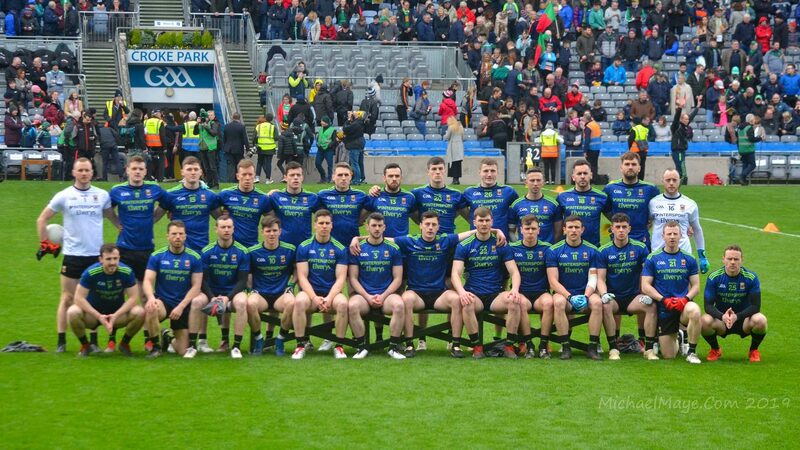 MAYO: David Clarke; Eoghan Reilly, Ger Cafferkey, Michael Walsh; Peadar Gardiner (0-1), Keith Higgins, Lee Keegan; Barry Moran, Pat Harte; Conor O’Shea (0-1), Darren Coen (0-1), Kevin McLoughlin; Evan Regan (0-1), Danny Kirby (4-1), Conor Mortimer (0-6, four frees). Subs: Jason Gibbons for Harte, Alan Feeney for Reilly, Enda Varley for Regan, Seamus O’Shea for Conor O’Shea. Roscommon 1-9 Mayo 0-14 (Ballinlough, 22/1/2012). MAYO: David Clarke (0-1, a ’45); Keith Higgins, Shane McHale, Lee Keegan; Richie Feeney, Donal Vaughan, Chris Barrett; Seamus O’Shea (0-1), Jason Gibbons; Kevin McLoughlin, Alan Dillon (0-1), Pat Harte (0-1); Alan Freeman (0-2), Barry Moran (0-1), Conor Mortimer (0-6, three frees). Subs: Conor Campbell for Clarke, Michael Walsh for Higgins, Alan Feeney for Vaughan, Andy Moran (0-1) for McLoughlin, Cillian O’Connor for Mortimer. HOME FINAL: Mayo 0-14 NUIG 0-4 (McHale Park, 27/1/2012). MAYO: David Clarke; Keith Higgins, Ger Cafferkey, Lee Keegan (0-1); Peadar Gardiner, Donal Vaughan, Richie Feeney; Barry Moran (0-1), Aidan O’Shea; Kevin McLoughlin (0-1), Alan Dillon, Pat Harte; Alan Freeman (0-3, two frees), Andy Moran (0-3), Conor Mortimer (0-5, four frees). Subs: Seamus O’Shea for Aidan O’Shea, Cillian O’Connor for Andy Moran, Eoghan Reilly for Cafferkey, Colm Boyle for Feeney, Evan Regan for Freeman. FINAL: Not played as Mayo unable to fulfil fixture. Laois 0-8 Mayo 1-11 (O’Moore Park, 4/2/2012). MAYO: David Clarke; Lee Keegan, Ger Cafferkey, Keith Higgins; Peadar Gardiner, Donal Vaughan, Richie Feeney; Seamus O’Shea, Pat Harte; Kevin McLoughlin, Alan Freeman (1-2), Alan Dillon (0-1); Conor Mortimer (0-5, three frees), Barry Moran (0-1), Andy Moran. Subs: Eoghan Reilly for Cafferkey, Jason Doherty for Harte, Enda Varley (0-2) for Andy Moran, Danny Geraghty for O’Shea. Mayo 0-5 Dublin 0-8 (abandoned at half-time due to fog) (McHale Park, 11/2/2012). MAYO: David Clarke; Kevin Keane, Eoghan Reilly, Keith Higgins; Peadar Gardiner, Donal Vaughan, Lee Keegan; Barry Moran, Aidan O’Shea; Kevin McLoughlin, Cillian O’Connor (0-1, free), Alan Dillon; Conor Mortimer (0-2, frees), Alan Freeman, Enda Varley (0-2). Sub: Richie Feeney for Gardiner. Armagh 0-11 Mayo 1-14 (Athletic Grounds, Armagh, 3/3/2012). MAYO: David Clarke; Kevin Keane, Ger Cafferkey, Keith Higgins; Richie Feeney, Donal Vaughan, Lee Keegan (0-1); Aidan O’Shea, Barry Moran; Alan Freeman (0-5, four frees), Alan Dillon, Jason Doherty; Conor Mortimer (0-4, three frees), Andy Moran (1-0), Enda Varley (0-4). Subs: Seamus O’Shea for Barry Moran, Colm Boyle for Keane, Pat Harte for Andy Moran. Mayo 0-11 Down 1-13 (McHale Park, 11/3/2012). MAYO: Robert Hennelly; Kevin Keane, Ger Cafferkey, Keith Higgins; Richie Feeney, Donal Vaughan, Lee Keegan; Aidan O’Shea, Barry Moran; Alan Dillon (0-2), Alan Freeman (0-2, frees), Jason Doherty; Conor Mortimer (0-6, frees), Andy Moran (0-1), Enda Varley. Subs: Seamus O’Shea for Doherty, Michael Conroy for Varley, Pat Harte for Freeman, Peadar Gardiner for Feeney. Donegal 0-17 Mayo 1-7 (Fr Tierney Park, Ballyshannon, 18/3/2012). MAYO: David Clarke (0-1, a ’45); Kevin Keane, Ger Cafferkey, Keith Higgins; Peadar Gardiner, Donal Vaughan, Lee Keegan; Seamus O’Shea, Barry Moran; Kevin McLoughlin (0-1), Andy Moran, Alan Dillon (0-1); Conor Mortimer (0-3, frees), Alan Freeman, Enda Varley (1-0). Subs: Pat Harte for Freeman, Richie Feeney for Keegan (inj. ), Cillian O’Connor for Varley, Jason Doherty for McLoughlin, Michael Conroy (0-1) for Mortimer. Mayo 0-13 Cork 0-14 (McHale Park, 25/3/2012). MAYO: David Clarke; Colm Boyle, Ger Cafferkey, Keith Higgins; Lee Keegan, Donal Vaughan (0-1), Shane McHale; Seamus O’Shea, Barry Moran; Kevin McLoughlin (0-1), Cillian O’Connor, Alan Dillon (0-2); Alan Freeman (0-1), Andy Moran (0-2), Michael Conroy (0-2). Subs: Peadar Gardiner for Keegan, Conor Mortimer (0-3, one free) for O’Connor, Danny Geraghty for O’Shea, Jason Doherty (0-1) for Conroy, Aidan Campbell for Boyle. Mayo 0-20 Dublin 0-8 (McHale Park, 31/3/2012). MAYO: David Clarke; Kevin Keane, Shane McHale, Keith Higgins; Lee Keegan, Donal Vaughan (0-2), Colm Boyle; Aidan O’Shea (0-1), Danny Geraghty; Kevin McLoughlin, Andy Moran, Alan Dillon (0-4); Conor Mortimer (0-8, five frees), Barry Moran (0-1), Michael Conroy (0-4). Subs: Jason Doherty for Barry Moran, Peadar Gardiner for Vaughan, Cillian O’Connor for Conroy, Aidan Campbell for Dillon, Jason Gibbons for Geraghty. Kerry 1-12 Mayo 1-12 (Austin Stack Park, Tralee, 8/4/2012). MAYO: David Clarke (0-1, a ’45); Eoghan Reilly, Ger Cafferkey, Keith Higgins; Lee Keegan, Donal Vaughan, Danny Geraghty; Jason Gibbons, Aidan O’Shea; Kevin McLoughlin (0-2), Andy Moran (0-1), Alan Dillon (0-1); Cillian O’Connor (0-6, frees), Jason Doherty (1-1), Michael Conroy. Subs: Kevin Keane for Reilly, Conor Mortimer for Conroy, Evan Regan for O’Connor, Shane McHale for Doherty. SEMI-FINAL: Mayo 2-15 Kerry 1-17 after extra-time (Croke Park, 15/4/2012). MAYO: David Clarke; Kevin Keane, Ger Cafferkey, Keith Higgins (0-1); Lee Keegan, Donal Vaughan, Colm Boyle (1-1); Barry Moran, Jason Gibbons; Kevin McLoughlin, Andy Moran (0-1), Alan Dillon (0-2); Conor Mortimer (0-7, four frees), Jason Doherty, Michael Conroy. Subs: Pat Harte (1-0, penalty) for Doherty, Enda Varley for Conroy, Richie Feeney (0-1) for Gibbons, Cillian O’Connor (0-2, one free) for Mortimer, Danny Geraghty for Barry Moran, Aidan Campbell for Harte (ET). FINAL: Cork 2-10 Mayo 0-11 (Croke Park, 29/4/2012). MAYO: David Clarke; Kevin Keane, Ger Cafferkey, Keith Higgins (0-1); Lee Keegan, Donal Vaughan (0-1), Colm Boyle; Barry Moran, Jason Gibbons; Kevin McLoughlin (0-1), Andy Moran (0-1), Alan Dillon; Conor Mortimer (0-1, free); Cillian O’Connor (0-6, five frees), Michael Conroy. Subs: Pat Harte for Gibbons, Enda Varley for Conroy, Danny Geraghty for Barry Moran, Jason Doherty for O’Connor, Richie Feeney for Dillon. SEMI-FINAL: Mayo 4-20 Leitrim 0-10 (McHale Park, 24/6/2012). MAYO: David Clarke; Kevin Keane, Ger Cafferkey, Keith Higgins (0-1); Lee Keegan (0-1), Donal Vaughan, Colm Boyle; Barry Moran (0-1), Danny Geraghty (0-1); Kevin McLoughlin (1-2), Cillian O’Connor (0-6, frees), Alan Dillon (0-3); Alan Freeman (1-0), Andy Moran (2-0), Jason Doherty. Subs: Richie Feeney for Boyle, Ronan McGarrity (0-1) for Geraghty, Conor Mortimer (0-2, one free) for Freeman, Michael Conroy (0-1) for Doherty, Enda Varley (0-1) for Andy Moran. FINAL: Mayo 0-12 Sligo 0-10 (Hyde Park, 15/7/2012). MAYO: David Clarke; Kevin Keane, Ger Cafferkey, Keith Higgins; Colm Boyle (0-1), Donal Vaughan, Lee Keegan (0-1); Barry Moran (0-1), Danny Geraghty (0-1); Kevin McLoughlin, Cillian O’Connor (0-3, two frees, one 45), Alan Dillon (0-2); Enda Varley (0-1, free), Andy Moran (0-1), Jason Doherty. Subs: Aidan O’Shea (0-1) for Geraghty; Michael Conroy for Varley, Alan Freeman for Doherty. QUARTER-FINAL Mayo 3-18 Down 2-9 (Croke Park, 4/8/2012). MAYO: David Clarke; Kevin Keane, Ger Cafferkey, Keith Higgins; Lee Keegan (0-1), Donal Vaughan, Colm Boyle; Barry Moran, Aidan O’Shea (0-1); Kevin McLoughlin (0-2), Cillian O’Connor (0-7, six frees), Alan Dillon (0-4); Michael Conroy (2-1), Andy Moran (0-1), Jason Doherty (1-0). Subs: Alan Freeman for Andy Moran, Richie Feeney for Doherty, Enda Varley (0-1) for Conroy, Jason Gibbons for O’Shea, Chris Barrett for Boyle. SEMI-FINAL: Mayo 0-19 Dublin 0-16 (Croke Park, 2/9/2012). MAYO: David Clarke; Kevin Keane, Ger Cafferkey, Keith Higgins; Lee Keegan, Donal Vaughan, Chris Barrett; Barry Moran (0-1), Aidan O’Shea; Kevin McLoughlin (0-2), Jason Doherty (0-1), Alan Dillon (0-3); Enda Varley (0-2, one free), Cillian O’Connor (0-7, three ‘45s, three frees), Michael Conroy (0-1). Subs: Richie Feeney (0-1) for Keegan, Alan Freeman for Varley (blood), Colm Boyle for McLoughlin (blood), Jason Gibbons for Feeney, Shane McHale for Keane, Kevin McLoughlin for Doherty, Seamus O’Shea (0-1) for Aidan O’Shea. FINAL: Donegal 2-11 Mayo 0-13 (Croke Park, 23/9/2012). MAYO: David Clarke; Kevin Keane, Ger Cafferkey, Keith Higgins; Lee Keegan (0-1), Donal Vaughan, Colm Boyle; Barry Moran, Aidan O’Shea; Kevin McLoughlin (0-2), Jason Doherty, Alan Dillon; Enda Varley (0-2, frees), Cillian O’Connor (0-5, frees), Michael Conroy (0-1). Subs: Alan Freeman for Doherty, Jason Gibbons (0-1) for Conroy, Richie Feeney (0-1) for Varley, Seamus O’Shea for Moran. PRELIMINARY ROUND: Mayo 1-14 Galway 0-15 (after extra-time) (McHale Park, 14/3/2012). MAYO: Paul Mannion; Michael Walsh, Niall Freeman, David Gavin; Caolan Crowe, Shane McDermott, Michael Forde (0-1); Danny Kirby, Danny Geraghty; Andrew Farrell, Aidan Walsh, Conor O’Shea (1-0); Evan Regan (0-2, one free), Cillian O’Connor (0-9, seven frees), Darren Coen (0-2). Subs: James Shaughnessy for Farrell, Brendan Harrison for Gavin, Conor Walsh for Coen (ET), Austin O’Toole for Shaughnessy (ET). SEMI-FINAL: Roscommon 1-11 Mayo 0-10 (Kiltoom, 21/3/2012). MAYO: Paul Mannion; Michael Walsh, Niall Freeman, David Gavin; Caolan Crowe, Shane McDermott, Micheál Forde; Brendan Harrison, Danny Geraghty; Andrew Farrell, Aidan Walsh (0-1, ’45), Darren Coen; Evan Regan (0-2, one free), Cillian O’Connor (0-3, frees), Conor O’Shea (0-3). Subs: James Shaughnessy (0-1, free) for Harrison, Danny Kirby for Farrell, Conor Walsh for Darren Coen, Austin O’Toole for Regan. SEMI-FINAL: Mayo 1-6 Sligo 0-6 (McHale Park, 24/6/2012). MAYO: Conor O’Malley; David McHale, Sean Moran, Kevin Lynch; Patrick Durcan, Cian Burke, Michael Plunkett (0-1); Brian Mullen, Adam Gallagher (1-2, penalty goal and two frees); Eoghan Lavin (0-2, frees), Stephen Coen, Diarmuid O’Connor; Darren Duffy, Shane Hennelly, Sean Regan (0-1). Subs: Conor Byrne for Duffy, James Quinn for Lavin. FINAL: Roscommon 0-10 Mayo 0-8 (Hyde Park, 15/7/2012). MAYO: C O’Malley; D McHale, S Moran, K Lynch (0-1); P Durcan, C Burke, M Plunkett; B Mullen, A Gallagher (0-6, 4f); E Lavin, S Coen, D O’Connor; D Duffy, S Hennelly, S Regan. Subs: D Duffy for E Lavin; J Geraghty for D McHale, J Quinn (0-1) for S Regan; R Coleman for B Mullen. QUARTER-FINAL: Mayo 0-19 Tipperary 1-8 (Croke Park, 4/8/2012). MAYO: Conor O’Malley; Joe Geraghty, Sean Moran, Michael Plunkett; Patrick Durcan (0-2), Cian Burke (0-1), Kevin Lynch; Brian Mullen, Adam Gallagher (0-4, 3 frees); Eoghan Lavin (0-3, two frees, one ’45), Stephen Coen, Diarmuid O’Connor (0-2); James Quinn (0-3), Sean Regan, Shane Hennelly (0-2). Subs: R Coleman for Hennelly, Conor Byrne (0-1) for Regan, Darren Duffy (0-1) for Mullen, Shane Hennelly for Lavin, Val Roughneen for Coleman. SEMI-FINAL: Meath 2-10 Mayo 1-11 (Croke Park, 26/8/2012). MAYO: Conor O’Malley; Joe Geraghty, Sean Moran, Michael Plunkett; Patrick Durcan (0-1), Cian Burke, Kevin Lynch; Brian Mullen, Adam Gallagher (0-3, one free); Eoghan Lavin (0-2, one free, one ’45), Stephen Coen (0-2), Diarmuid O’Connor (1-0); James Quinn (0-1), Sean Regan (0-1), Shane Hennelly (0-1). Subs: Conor Byrne for Regan; Darren Duffy for Lavin, David McHale for O’Connor, Sean Regan for Quinn.